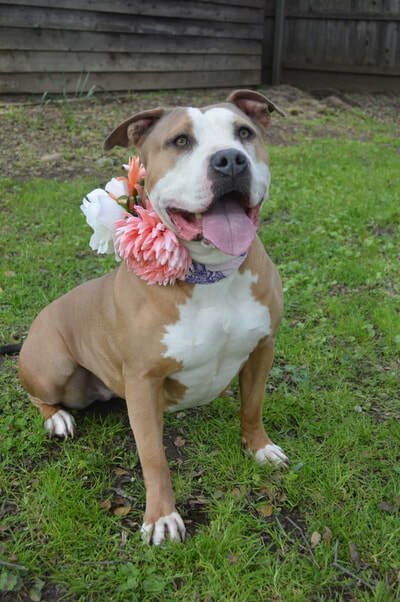 Starla is a 5 year old beauty! She is a mixed breed girl who comes in at a tiny 80 lbs, lol! She's a big girl but she's full of love. 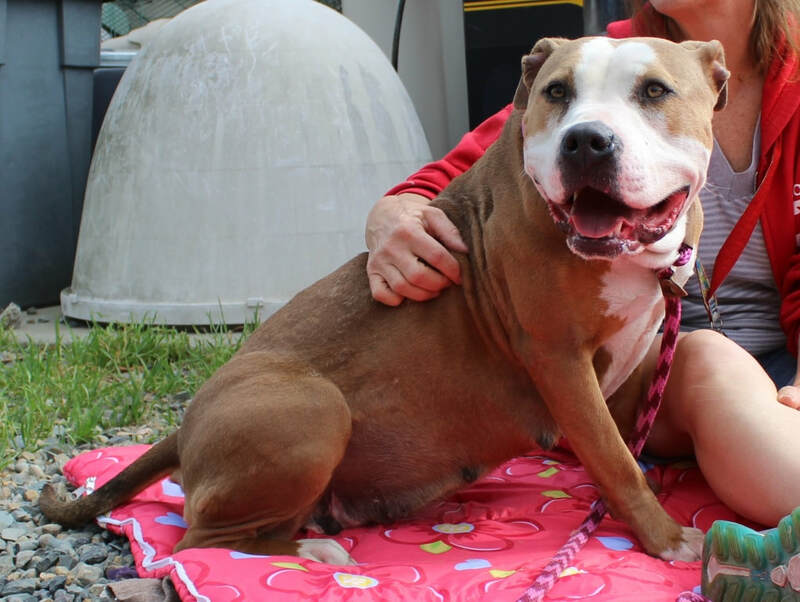 Starla was found as a stray so we do not have any history on her prior to coming to the shelter but she's spent time in her foster home and has proven to be a true lover. She adores people and enjoys the company of other dogs. 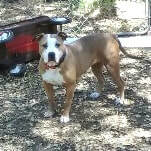 Starla is crate and house trained, UTD on vaccinations, microchipped, heart worm negative, spayed and healthy. Child appropriate? Starla would do fine with older children who can respect her boundaries and let her feel comfortable. She's been around kids and done well and likes to give them kisses! Other dog appropriate? Starla is hot and cold. She likes the dogs she lives with but she has not done well on recent dog meet ups. We have learned that she needs time to warm up. 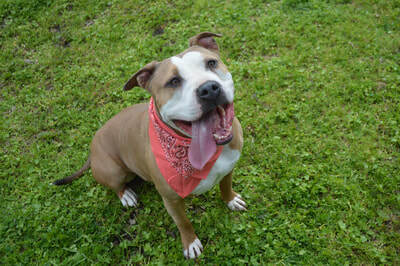 Once in the home, allowed to be crated near another dog, and develop a relationship, she is fine. She just doesn't do well with immediate meet ups due to fear. 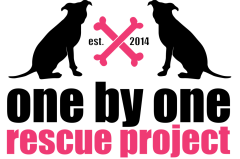 If someone is interested in fostering to adopt, that would be ideal as she warms up to other dogs in the home. She would also do great as an only pet. Cat appropriate? Starla is pretty focused on cats so we don't think she'd do well in a home with cats. She might chase them a lot which could stress them out. How is she with strangers? Starla can be shy upon first meeting new people so we always start with treats. She seems extra shy with some men but warms up quickly once she finds out they are nice. She may need slow intros or ones done with treats just to make her feel at ease but she' met many people and done really well. What is her play style? As mentioned, Starla is a big girl and she can get a little rambunctious when playing but she tires out quickly. She loves to roll around and wrestle with her foster brothers but is gentle. She's isn't a super high energy girl and she tires out pretty easily. Does she like toys? Starla enjoys stuffies and will carry them around but she doesn't seem to play with them a lot. She really likes her ball and loves to play fetch. Does she like water? She will not go in a kiddie pool and doesn't seem excited by the hose so we'd have to say she's not a fan of water. Does she like car rides? Starla is a bit shy about getting into the car but once in she rides well. We wouldn't say she loves car rides but she does ok when having to go for a ride. Exercise level needed? 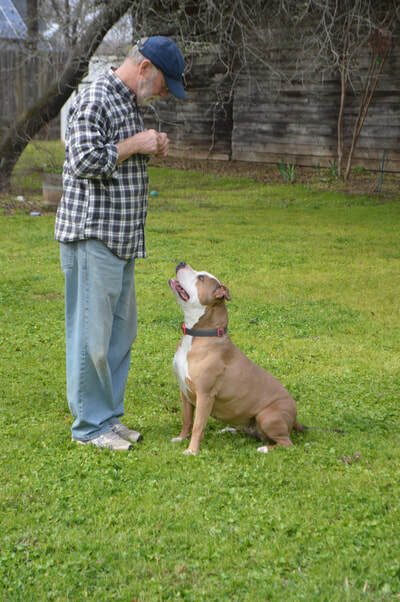 Starla would do fine with a daily walk around a mile or so and some time playing ball in the back yard. She is a medium energy level dog and does not require extensive exercise to wear her out. Behavior issues? Starla can be shy when meeting some new people. When she's with someone she trusts she does well but if out of her element she can be shy. 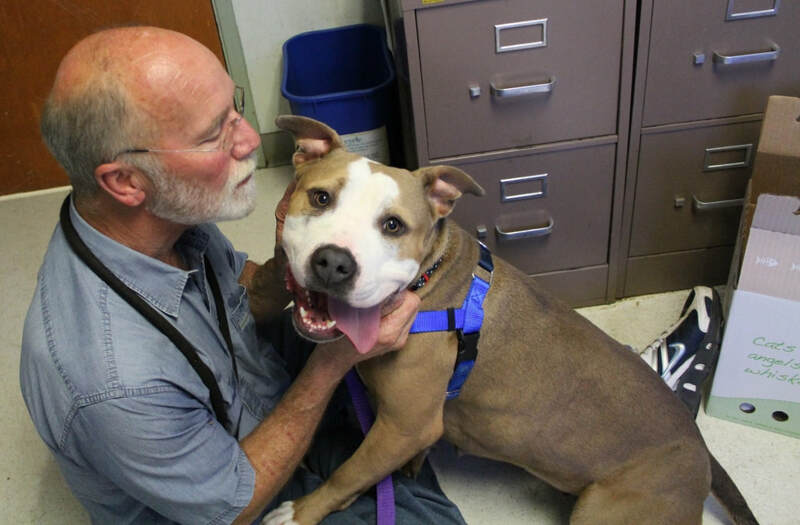 When first at the shelter she was nervous around men but over time has overcome that and since being in foster care has met several men and lots of people and done great. She just needs to be given some treats and spoken to kindly and she warms right up to you. Skills? Starla knows sit and down and is working on returning her ball to you during fetch. Special/endearing things? Starla is a very loving girl. Even though she is almost 80 lbs, she will try and sit in your lap if she can get there. She adores people and she's very gentle for a big girl. She's a great combination of loving and snuggly and playful. If you are looking for a true companion to adore you, this is your girl. Watching Starla play with other dogs is extremely heartwarming too. She seeks so much joy playing with her foster siblings and she's very trusting with them. 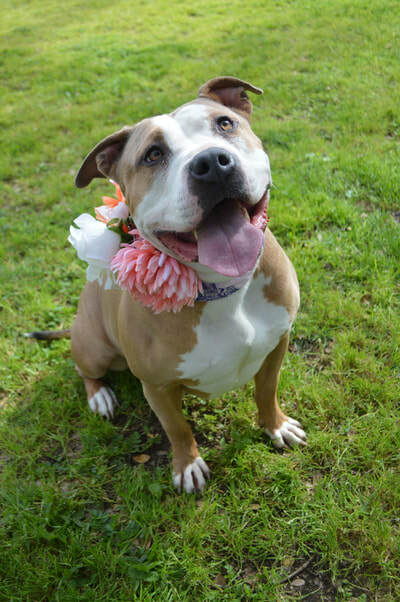 She is one of those dogs who just craves interaction and attention from everyone around her and exudes happiness. She also loves to give kisses, did we mention that? She is the make out queen! 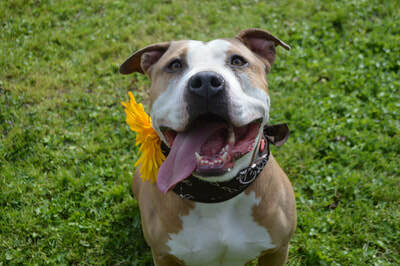 She will come over and plant a big wet one on you and then leave a little slobber behind so you remember her :) Many people are scared of big dogs like Starla but she will prove to you that big ol' bullies are kind and loving souls whose only danger is smothering you to death with kisses! Ideal home? 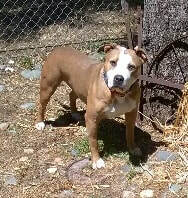 Starla would do well in a medium energy home where she can be a part of the family. Since she can be shy on occasion, a home that isn't super busy would likely be best. 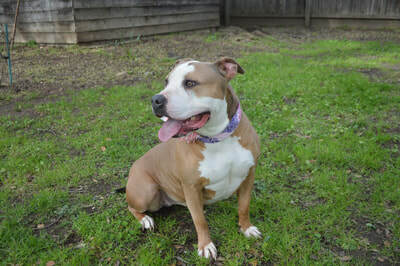 She would do ok with kids as long as they are respectful and don't try and ride her like a horse or pull her ears etc...We think a home with another friendly dog would be great for her since she enjoys playing with her four legged companions so much. We'd hate for her to be the only dog where she misses out on that playtime. Starla is a lover so it's imperative that she go to a home who has the time to give her the attention she deserves and really care for her. A home with large dog experience is a plus because it's very different having a 80 lb. dog than a 40 lb. one.